Stories make the best condiments. Just think of how many times you’ve tucked into a favorite dish with friends or family and commenced reminiscing about past eating experiences. Maybe it’s the one your uncle Howie tells about the neighborhood bakery that made the best bagels and phenomenal seeded rye and sadly closed down years ago, with nothing opening since that holds a candle to it. Or perhaps you’ve heard that bagels were invented in 1683 when bakers in Vienna celebrated the Polish King Jan Sobieski‘s victory over the Turks by creating a roll in the shape of his stirrup, (German for stirrup is “bügel“). And then there’s the tale that purports to explain why real bagels are boiled before they’re baked. Church leaders in medieval Poland wouldn’t allow Christians to buy any food from Jews, unless it was boiled. 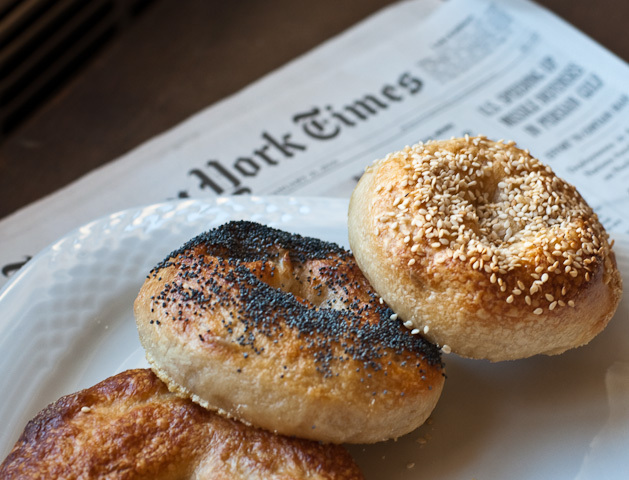 One of the tastiest, and maybe even true, yarns I’ve discovered about bagels recently is the origin of the confederation of Thai bagel rollers found in the best bagel shops in New York these days. If you go into any number of reputable bagelries, where everything, including the shaping of the bagels, is still done by hand, you may be surprised to learn that the toothsome, crusty, chewy delight you’re about to sink your teeth into was created by a person originally from Thailand. Milton Parker, the owner of the Carnegie Deli, writes in his history of the restaurant, How to Feed Friends and Influence People, that in the 1990s when there was a lot of money sloshing around in Thailand, the government decided it would be a good idea to teach bagel-making to some of its citizens. So it contacted some retired members of the International Bagel Bakers Union Local 338 in New York City and invited them to Thailand. As with many brilliant ideas conceived during boom times, the bagel never really took off in rice-centric Thailand. But, some of those Thai bagel men, and their sons emigrated to the New York and easily found jobs in the better bagel shops. After recently making bagels at home for the first time, I can tell you that the rolling of the bagel is an important component. Some of mine came out looking very authentic and others, well, let’s just say I need a little practice. But I didn’t care how they looked because they had that snappy crust and chewy interior praised by all bagel lovers. Best of all, I can report that making bagels isn’t any harder than baking bread. It is time consuming but bagels freeze exceedingly well, so make a big batch and fill up your freezer. If you live in a part of the world where it’s difficult to get real bagels (as opposed to rolls with holes), this recipe could be a life saver. Modern bagels weigh in at a hefty 7 oz. while historically, they were much smaller (2-3 oz.). This recipe makes about 12 modern size bagels or 18-24 2-3 oz. bagels). I recommend weighing out your pieces of dough so they are all the same size and will cook evenly. This recipe takes two days to make because the dough is “retarded” overnight in the refrigerator to develop flavor. If you’re in a hurry you can make it without that step, but the bagels won’t be as flavorful. Please read the recipe all the way through before making your shopping list as there are separate ingredient lists for some steps. In a 4 quart mixing bowl, use a fork to thoroughly stir the yeast into the flour and then add the water and stir with a spoon until it makes a thick sticky batter. Cover with plastic and leave at room temperature until the batter has doubled in size and is quite bubbly (about 2 hours). It may take longer if your kitchen is chilly. Malt is a very important ingredient for this recipe as it gives the authentic bagel flavor. Malt syrup is usually sold in health food stores as an alternative sweetener. I was not able to find malt powder, but have heard that some Whole Foods outlets carry it. In the bowl of a stand mixer, stir the additional yeast into the sponge and then add 3 cups of the flour, all of the salt and the malt, and mix on low speed with the dough hook until the ingredients are well combined and form a ball. Then, slowly work in the remaining 3/4 cup of flour to form a stiff dough. You can do all of this by hand, with a spoon but it is a very stiff dough so be prepared for a serious workout. Turn the dough out onto a clean surface and knead for 10-15 minutes. When finished kneading the dough should pass the “window pane” test and should read 77-81 degrees F on a thermometer. If you haven’t used the “window pane test” before, here’s a great video explaining it. If your window pane is still tearing after 10-15 minutes of kneading, add a few drops of water and knead a little more. If your dough is very sticky, add a tiny bit of flour and knead some more. Baking depends very much on the current weather conditions, especially the humidity, so these little adjustments may be needed. Divide your dough into pieces of the weight you would like your bagels to be. I made 18 3 oz. bagels from this recipe. Form each piece into a roll by stretching down the “sides” of each piece and pinching the dough together in a seam at the “bottom.” Place the rolls, seam down, on a clean surface, cover them with a damp kitchen towel, and let them rest for 20 minutes. Line 2 sheet pans with baking parchment and spray them lightly with a neutral spray oil (I actually used olive oil because it’s all I had around and it didn’t seem to affect the flavor). Shape the bagels by using your thumb to poke a hole through the center of your roll and then carefully rotate your thumb, gently stretching the dough around it into an even, doughnut shape. For my 3 oz. bagels I made holes that were about 1 3/4 – 2 inches in diameter, for larger bagels the holes would be larger. When you first stretch the dough it may bounce back. Keep working with it until the hole remains the size you want after you put it down. Put each shaped bagel on the prepared sheet pans, about 1 1/2 inches away from its neighbors. Mist the bagels lightly with spray oil, wrap the pans in plastic and let them rest at room temperature for about 20 minutes. Next we check to see if the bagels are ready for their overnight rest in the fridge. Fill a small bowl with room temperature water. Carefully take one bagel and drop it in the bowl. If the bagel floats within 10 seconds, it is ready. If not, then pat it dry, return it to the pan, wrap up the pan and give them another 10 or 15 minutes before testing again. Once a bagel passes the float test, pat it dry, return it to the pan, wrap up the pan and place the pans in the refrigerator over night or for up to 2 days. Mr. Reinhart’s recipe calls for putting baking soda in the boiling water. Another story I’ve been told about bagels is that the real secret ingredient is New York City water which happens to be a lot softer than much of the water in the US. I’m guessing that Mr. Reinhart has you add baking soda to imitate this softness. I left it out since I am lucky enough to have AOC New York City water coming right out of my tap. Preheat your oven to 500 F and put two racks in the center. Bring a large wide mouthed pot of water to boil on top of your stove. Add the baking soda if using. Remove the bagels from the refrigerator and drop them gently into the boiling water. Do not crowd the pan, only put in as many as will fit comfortably. Boil the bagels for 2 minutes and flip them over and boil them for another 2 minutes. While the bagels are boiling, sprinkle cornmeal on the same parchment lined pans, this will help prevent the bagels from sticking. When the bagels are boiled, remove them from the water with a slotted spoon or skimmer and place them back in the cornmeal sprinkled pans. If you are going to top your bagels, do it immediately after they are removed from the water, or the toppings will not stick. Repeat until all bagels are boiled and topped. Bake in the center of your oven for 5 minutes, then lower the temperature to 450 F. (Note: I actually forgot to lower the temperature, and it didn’t seem cause any harm). Bake for an additional 10-15 minutes or until the bagels are a dark golden brown. Partway through the baking rotate the pans, swapping racks and also turning them 180 degrees. Cool on racks for about 15 minutes and serve with the traditional accompaniments of cream cheese (just a schmear), Nova, Gravlax, red onion, capers, whitefish, etc.